If you need a breakdown of all of your Invoices and Credit Notes - either for your entire organization or for a particular location, client or contact, you can use Operate's Reports to generate it. To do so, go to Reports > Invoicing Reports and filter by the word 'printed'. 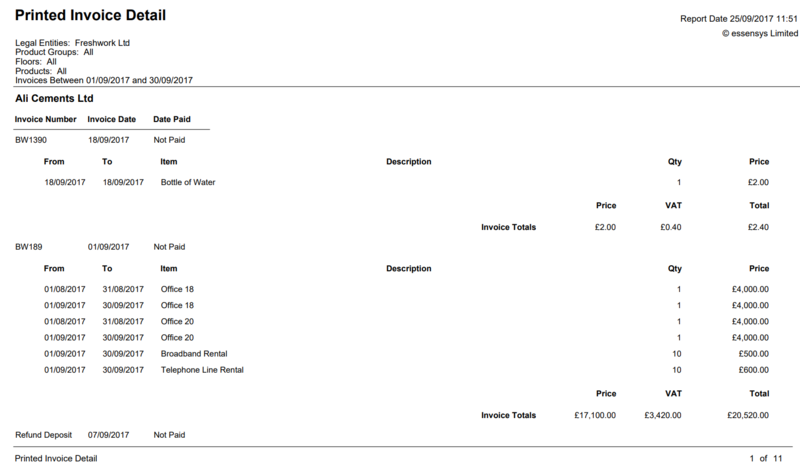 You will find two types of reports: Printed Invoice Summary and Printed Invoice Detail. Printed Invoice Summary Reports will list all your Invoices and will provide the Invoice No., Invoice Date, Date Paid (mentions 'Not Paid' if it's the case), Client ID, Client Name, Net Amount, Vat Amount, Total Amount. The same information is provided for any Credit Notes included in the Report. Printed Invoice Detail Reports will list each client with their corresponding invoices, which are in turn broken down to the charges each invoice contains. Each invoice is listed with its Invoice Number, Date and Date Paid; as well as Invoice Totals for Price, VAT and Overall Total. Each charge lists the Date From/To, The Item, Charge Description, Quantity and Price. Credit Notes are listed with the same information. If you need the list in any third party application, you can export the report to Excel.